A recent study by Dr Kenneth K. Hansraj a Chief of Spinal Surgery has highlighted the impact that the increasing use of mobile phones is having on our neck and upper back. A recent study has shown the detrimental impact the increasing use mobile phone use is having on our neck and upper back health. 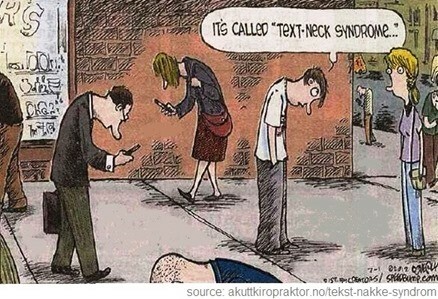 When compared with a neutral head position, increasing the downward angle of the head and neck (most commonly associated with looking at a mobile phone screen) has shown an increase in the load experienced by the spine. For example with the neck at 15° of flexion there is 2.5 times the load exerted on the neck by the head and at 60° a massive 5 times the load exerted on the neck by the head. This increase in load can lead to changes in normal posture and even begin to damage some of the structural elements of the neck and upper back, which both can lead to neck and upper back pain.